That’s a lot of cups! Let’s start where all the meat is – the new racetracks. Comprised of four remade series favourites and four all-new tracks, at first glance this pack seems oddly fixated on the GBA entry in the series, Mario Kart: Super Circuit. Two of the eight new tracks are remakes from that first portable entry in the series, although it should be noted that they are nigh-unrecognisable from their original flat forms. Cheese Land is now a yellow mass of incredibly steep hills and deep valleys, with holes in the cheesy landscape serving as shortcuts and destructible chunks of the crumbly stuff littering the off-road sections. It’s not the most inviting of locales for newcomers, but has enough going for it to satisfy more seasoned Mario Kart players. Ribbon Road is the other GBA remake, and it is obscenely gorgeous. The mostly gentle curves of the track have been reimagined as a Toy Story-esque fairytale castle playset, complete with a highly detailed, fully rendered bedroom setting that exemplifies the above-and-beyond visual design that has characterised Mario Kart 8 ever since its launch. Like, are you serious? Look at all this unnecessary detail! The 3DS’ Koopa City (known as Neo Bowser City in the USA for some odd reason) also returns, and visually it’s a fine choice for the HD treatment. Mario Kart 8‘s eyeball-slaying lighting engine is put to work on the shiny surfaces of its perpetually rain-soaked roads, where traction once again loosens up to keep players on their toes. But let’s be honest, the real star of the remade track section is Baby Park, appearing in its full seven lap glory for the first time since Mario Kart: Double Dash!! The simplest and most hectic Mario Kart track in history is now entirely anti-grav enabled, granting new levels of insanity to the inevitable kart bumping chaos and item carnage that defines the fan favourite circuit. Items, destruction, drifting, colours, insanity everywhere. Of the four brand new offerings, Super Bell Subway is the least remarkable of the lot, at least in my opinion. Resembling a London-ified mix of Toad’s Turnpike – one of my least favourite Mario Kart tracks ever – and Coconut Mall, it does at least offer some cool things to look at. Old school hanging clocks clash with modern vending machines and rustic graffiti to sell that grimy public transport tunnel feeling, though I just cannot stand large vehicular obstacles in Mario Kart tracks. The remaining three newcomers are simply superb. 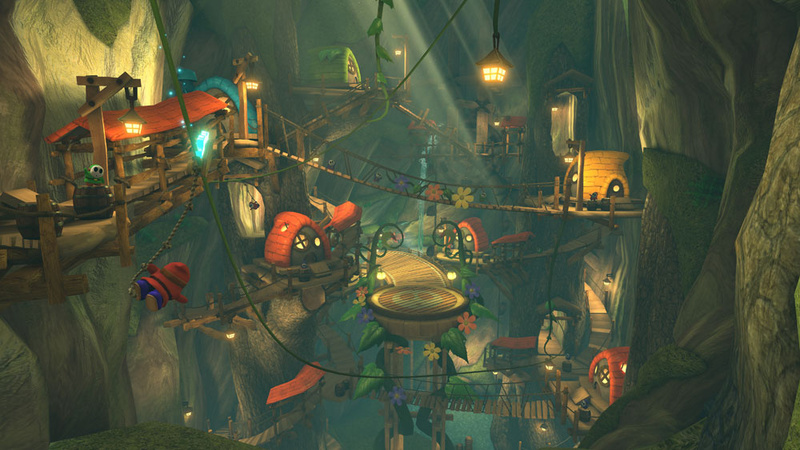 The headlining Animal Crossing track is probably the best of the lot, starting with some wonderful track design, adding a plethora of cute nods to fans of the Animal Crossing series (like replacing coins with bells) and then layering on a variable mechanic that changes the season each time you race. Each season adds something different to the track, from snowmen obstacles in winter to leaf piles containing items in autumn, and so on. It’s a real treat for fans of the oddball life sim and regular Mario Kart players alike. Wild Woods probably takes the title of most visually impressive track this time around, sending racers straight up the side of a giant tree as all manner of background details pop off the screen in vibrant colour. Its structure also succeeds in crunching together a myriad of features from other successful Mario Kart tracks to create a constantly engaging race flow. Finally, Nintendo simultaneously acknowledges F-Zero fans and lowers the chance of a new game in the futuristic racing series by finishing things off with Big Blue, the second F-Zero homage in as many DLC packs. This one is a sprint, however, and a gloriously high octane one at that. More rich, lively, completely superfluous detail. The DLC also contains some new characters and karts, but as I’ve said before on this blog I’m not super crazy about those, as I tend to stick to one setup anyway. One of the four new karts, the sports car-styled P-Wing, does have the same stats as my favoured Circuit Special racer, which is pretty cool I suppose. I will say that the new additions in this department do keep up with the high visual standard of November’s new faces, however, balancing the seething menace of Dry Bowser and his matching Bone Rattler with the flat-out adorable charm of the male and female Animal Crossing villagers, their assistant Isabelle, the Vespa-inspired City Tripper and the diminutive Streetle, which sums up the real spirit of Animal Crossing as well as anything. I mean, let’s be honest. Many Mario Kart fans seem to worship Dry Bowser, though I can’t figure out why. 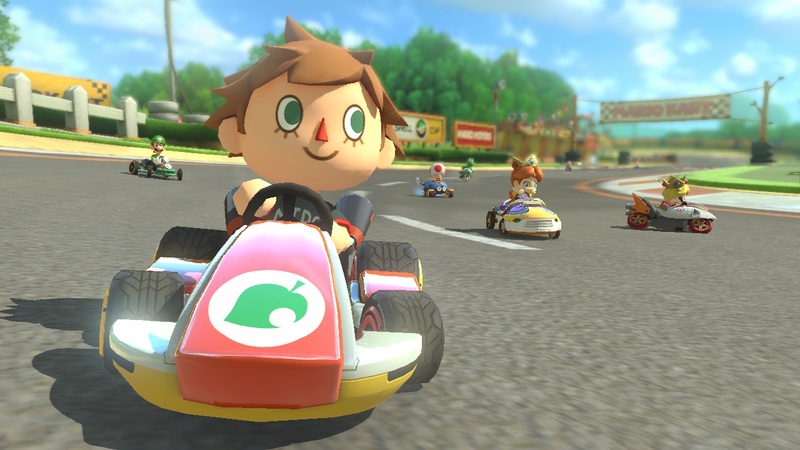 For the first time since the November pack, Mario Kart 8 has also been updated, this time to “Version 4.0”. There are two significant changes in this completely free patch, the first and most significant being the addition of a 200cc mode for the first time in franchise history. This is truly a game-changing addition, as the sheer amount of velocity you reach in this mode calls to mind a certain Spaceballs quote. It gets so unbelievably fast that Nintendo has made a point recently of reminding players that the brake button exists, and unless you go for the lightest possible setup, you will absolutely need to use it. 200cc fundamentally changes the way you look at and play each map, making new shortcuts possible for some and turning others into near-constant aerial battlegrounds (Try the Excitebike track on 200cc – you’re gonna have a good time). The second major change expands the list of amiibo figurines compatible with Mario Kart 8 from 10 to 19, unlocking even more Mii costumes for use in the game. The majority of these look pretty good in my opinion, especially the Rosalina costume, which comes complete with a side fringe, and the Bowser costume, which goes full-on punk and looks great on a bike. It annoys me a little too much that I won’t be able to get all the ticks until July, when the Olimar amiibo releases. Though my complaints about Mario Kart 8‘s ongoing problems with audio balance continue to go unchecked (The new arrangements sound great, after all, and the Animal Crossing stage even has a different one for every season, yet we still can’t hear them over all the sound effects), this second major content drop makes a fantastic game even better. It’s extremely hard to find any significant problems with what Nintendo has done here. The company’s Mario Kart team have outdone themselves once again with their astounding attention to detail and design, and I really hope this new direction represents a good omen for the future support of Nintendo’s major games. If you own Mario Kart 8 and have yet to buy either of its juicy downloadable content offerings, I daresay you will not find better value for your 16 bucks anywhere else in gaming right now.